The focus of this publication is the relationship of Lord Skanda with Miss Hilda Charlton, a mystic teacher who was in this world and yet not of it. Many Perfected Beings in the spiritual realm of the universe spotted her and had ongoing relationships with her. The Eternal Godhead is One and Absolute, but its manifestations are many. In the Divine Hierarchy, Lord Skanda occupies a unique place. Being a divinity exclusively fashioned by Siva, arising out of his tapas (penances) in the form of six sparks which merged later into one, Lord Skanda represents not only the quintessence of but an improvement upon Siva. He played the role of guru for Siva at Swamimalai. Creations in upper worlds have greater capabilities than and function differently from human beings. Forms can travel with the speed of light at no cost, without passports or visas. There is no need for food. Whatever is wanted is created at the moment of thought. Deities like Lord Skanda have the capacity to be young and old, to be several places at the same time, and to take many forms. The type of activities we undertake determines the form of Godhead from which we may draw easily. When the devotee is truly perfect and is ready to move on to higher rungs of creation, deities take the desired form and live with the devotee on a daily basis. In Hilda's case, Lord Skanda was living with her as a ten-year-old boy. Without guile, with a ready smile, ever playful, He immersed Hilda in an ocean of joy. One day Hilda told me that Lord Skanda was getting naughtier and naughtier by the day and was tickling her neck all the time with feathers. Once when Hilda went to John F. Kennedy Airport in New York, Lord Skanda made a two-wheeled chariot for Himself, hooked it to Hilda’s car, and traveled in it. He had a small noise-maker drum in His hand and was creating a racket. Skanda in this form of an innocent lad brought out in Hilda her pure and simple receptive mind. Possession of a pure child’s mind made it easier for her to focus on and draw from Godhead. He was excellent company, too. I am now certain that Lord Skanda brought Hilda and me together. Just a few days before we established the Hindu Temple Society of North America in January 1970, Hilda was introduced to me. Recognizing her spiritual worth, I invited her to become a member of the Board of Trustees of the Society, which has as its endeavor the task of bringing Hindu temples to North America so that Hindu teachings and methods of worship might be available in an ecumenical framework. Hilda was a member of this team until January 29, 1988, when she made the transition from this world. Soon enough I became close to Hilda and began asking her to get me letters from Lord Skanda addressed to me. She sometimes took my requests seriously and gave me some wonderful communications from the Lord, so full of meaning, guidance and grace. In due course, I learned how to apply pressure on Hilda, who in turn badgered the Lord. Whenever I was depressed over the years, this tonic was made available to me. I treasure these communications, which always had as their main theme the conquest of the lower self and becoming a better instrument of the Lord in service. They de-emphasized worldly material values and pointed the way to equanimity and spiritual growth. Lord Skanda instructed Hilda to join hands with me in developing the Jyoti concept and philosophy. Jyoti is known as Saravanabhavayai. Lord Agasthya, the preeminent sage, and Lord Nandi, who acts as Siva's bull, had indicated to me through consultations with Nadi holy men (mediums who read out messages from volumes of Palmyra leaves known as madi sastras) that the vel, or trident, in the hand of Lord Skanda was not an instrument but a deity in its own right. The Universal Mother, who is Light-Consciousness, had given a part of Herself in the form of a vel to Lord Skanda. He taught us that the vel symbolizes our spine and that Jyoti is the kundalini energy that rises therein and becomes the Goddess of Wisdom in our foreheads. Since wisdom is to see God in all creation, service to creation has become the cornerstone of Jyoti philosophy. On the first occasion when the puja was held, there were significant miracles. Some ghee, or clarified butter, spilled on the steps of the Ganesh sanctum sanctorum, and when this was wiped up, sparks flew. 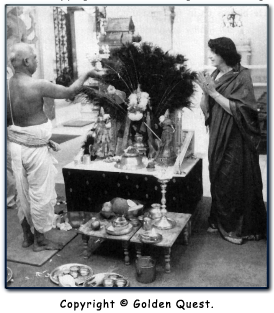 Also, in front of the figure of Brighu Maharishi, His favorite blue feathers were found. When Hilda led the pujas, the temple, a holy place full of the finest vibrations, received an additional voltage of sanctity and radiance. It was so apparent and easy to partake of. This book provides the substance of many a teaching of Lord Skanda. He is described by the sages as a deity who is easy to please and who readily responds. He is sometimes called Kali-Yuga Varadan, the great giver in this Kali Age. In South India, there are dedicated to Him six great temples of worship, located for the most part on hilltops in Tamil Nadu. His forms in those temples are suited to different stages in the evolution of the devotee. When peace and bliss are required, the forms at Thiruthani and Thiruparankundram are helpful. The image at Swamimalai, where Lord Skanda taught Siva, is of value in learning mantras and spiritual advancement. The form at Thiruchendur shows the Lord prepared for battle. Renunciation of the world is assisted by the form at Palani. Total wisdom is obtained by concentrating on Pala Mudir Solai, where there is no form but only a vel, or Jyoti, resides. 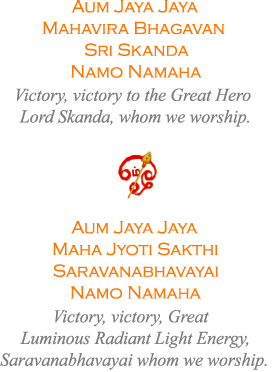 It is said that no deity responds more easily than our dear Lord Skanda. In whichever form we worship Him, He blesses us in full measure and is truly bountiful.